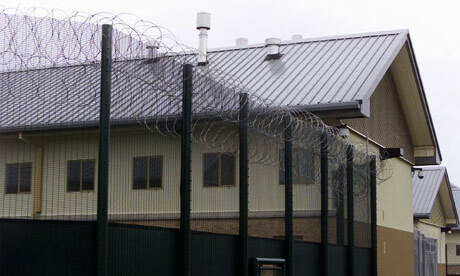 Yarl’s Wood is like prison, your freedom has been taken away, your rights don’t apply. They talk to you like you’re a child. If the fire alarm comes on, they’re like “go to your room, go to your room, go to your room!” even though we’re old enough to know what the fire alarm means. Those of us who’ve done health and safety know that your room is the last place you should go – we should go to the fire exit. We’re in the middle of nowhere here. No one is seeing what is happening, so they use that opportunity to manipulate and dictate. They push things under the carpet until it is their word against ours. We don’t know what the next thing is going to be. We have to use everything we have to protect ourselves and each other. They use their uniforms to exercise their power. When I’m talking about this, I just feel like exploding because everyone has this mindset that Britain is safe, that everyone can exercise their rights here. But it’s not. It’s like an apartheid that’s gone underground. You don’t know who is going to believe you when you speak about it. After you leave here, that’s when you suffer more. We get to know each other and love each other and understand each other. People outside can’t understand in the same way. The pain we go through makes us strong, we bond and care for and protect each other. If you hear a scream, even if you are eating, you drop everything and run to see what is happening to one of us. If I let them treat one of us this way, tomorrow it might be me they come for. As an asylum seeker you can’t work, but some of the women here work, washing dishes for £1 an hour. I’m too political to find myself washing their dishes; if I’m going to work here, they can issue me a work permit and pay me minimum wage! They always threaten you with Kingfisher [segregation] for anything. They say it’s not prison but it apples the same. Even the bedding, the cutlery looks like in prison. In prison it’s better because you know you’re serving your sentence and then that’s it. My journey always meets with pain, trauma and abuse. It’s always up-hill. Yarl’s Wood is just part of my journey. When I came to Britain I had a taste of being cared for, of being considered someone at last by people I met in the community. It’s an experience I’m grateful for and will never forget. It’s from that experience, that’s how I know that what’s happening here is not right. Even when the hope is lost, I know there is light at the end of the tunnel.